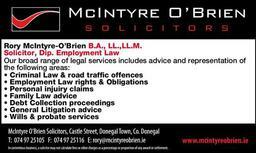 McIntyre O'Brien Solicitors is a law firm based in Donegal Town, County Donegal which serves the North-West region of Ireland. 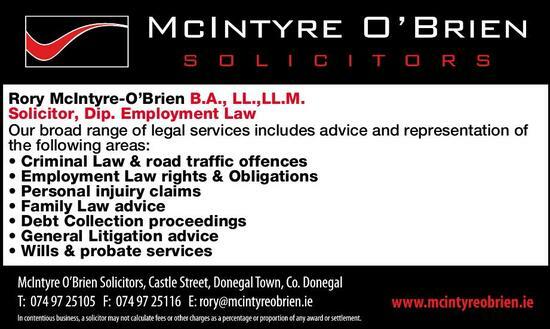 We provide a broad range of legal services, including advice and representation for our clients in a wide variety of areas including Criminal Defence, Employment Law, Personal Injuries, General Litigation, Debt Collection, Family Law, Probate and Estate Planning and Conveyancing. We are committed to offering the highest professional standards and to ensuring that all matters are dealt with in our client's best interests. We believe in integrity, commitment and client care in carrying out our services. We ensure we can deal with any legal problem in our areas of practice with maximum speed and clarity.